On this wonderful tour we'll experience the very best of the Magical Isle of Skye. The Isle of Skye is immortalised in song and renowned around the world for its scenery and seascapes. Join us for the day to explore this most magical isle. Our day’s drive begins with fabulous views over the Moray Firth then onwards through the Black Isle to Garve. Our first stop of the day is in the secluded village of Achnasheen then we continue our journey through picturesque Glen Carron. We head ‘over the sea to Skye’ by way of the road bridge, rather than the ‘bonnie boat’ of the song, and make for the town of Broadford. Then we drive along the picturesque coastal route enjoying views of the little islands of Pabay, Scalpay and Raasay. At Sligachan we’ll get some of the best views of the Cuillin Hills which dominate the landscape. As we follow the banks of Loch Portree we get splendid views of the largest community on Skye, Portree. The name is said to mean Port of the King and you’ll find it to be an attractive town with a picturesque harbour complete with brightly painted houses. Somerled Square is the centre of the town and bustles with activity. If you are in the market for a souvenir then the surrounding streets have a wide choice of shops with locally made goods - this is also a great place to enjoy lunch. As we cross back over theSkyeBridgeto the mainland, look out for the littleislandofEilean Ban. Gavin Maxwell, author of ‘Ring of Bright Water’ about a family of otters, lived in the lighthouse keeper’s cottage for a while. One of the most iconic images of Scotland is Eilean Donan Castle, which sits on an island at the head of Loch Duich. We make a stop here so you can visit and enjoy the views from this most photographed of castles *. We continue through Glen Shiel, scene of the 1719 battle, where the dramatic range of mountains known as the ‘Five Sisters’ dominate the landscape. The last stop of the day is in the village of Invermoristonto see the charming ruined bridge designed by Thomas Telford, who constructed the Caledonian Canal. Our day’s drive end’s along the banks of Loch Ness as we return to Inverness once more. 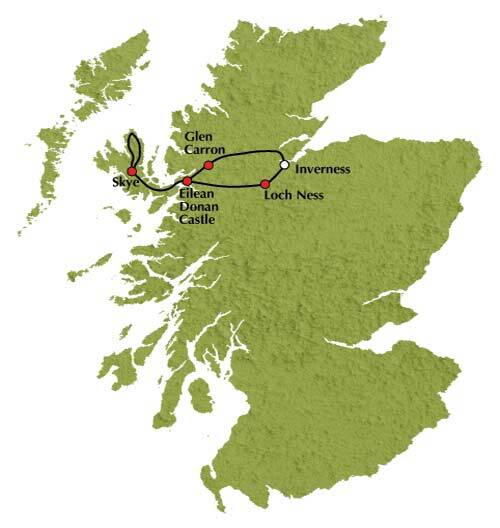 Tour Highlights: The Black Isle, Achnasheen, Glen Carron, Isle of Skye, Cuillin Hills, Portree, Eilean Donan Castle, Glen Shiel, The Five Sisters, Invermoriston and Loch Ness.